Why was I in Boston on Columbus Day after spending the weekend in Minneapolis? Flights back to New York were too expensive even months in advance, but flights to Boston on Sun Country were not. From Boston, I was able to book a cheap flight to Newark, although in hindsight, a bus would have been even cheaper. 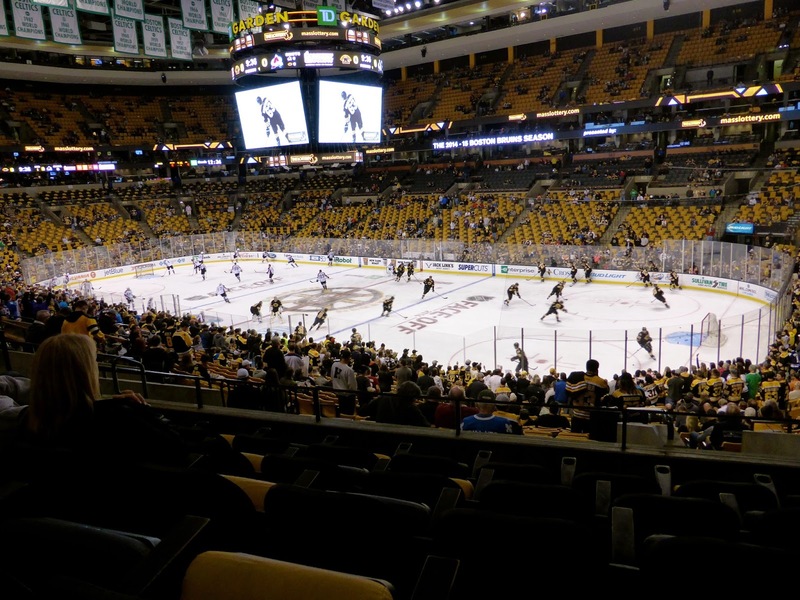 Anyway, I chose Boston because the Bruins happened to have a matinee game against the Avalanche. My friend Dom would also be attending so I met him at South Station and we made our way to TD Garden. I visited here as part of my quest to enter Club 122 back in January (Leafs won!) but was happy to spend the afternoon here, as the Garden is one of the league’s better venues, although it is also one of the most expensive. We found loge seats from a friendly neighborhood scalper and ended up sitting behind several of the players’ wives (view from the seat below). They can be distracting in more ways than one; they are obviously attractive and very well dressed, but what is less appealing is that they are not at all interested in the game. Their children bounce around while the wives have conversations with each other, sometimes standing at inopportune times. Not a major problem but a minor inconvenience; I found it interesting that they really couldn’t care less about the action on the ice, even when their husband was out there. Other than that, not much else to say. I usually won't post here when I revisit a stadium I have seen before, unless it is for a Toronto game, but this afternoon affair had a surprising finish. The Avs came in having been shutout through their first two games against Minnesota, while Boston was also struggling to score, netting only three goals in three games, going 1-2 in that time. A low-scoring tilt was expected, and that is exactly what happened, even with both teams starting their backups. 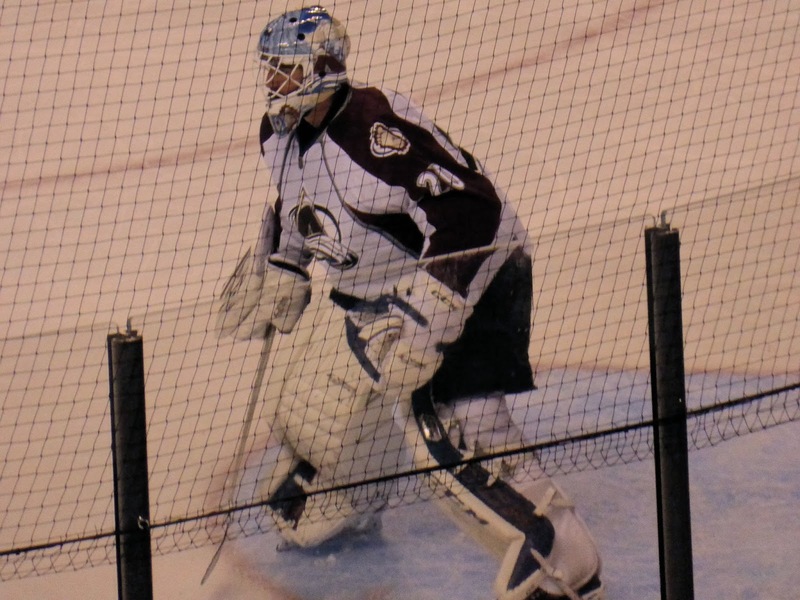 After a scoreless first period that saw some good saves by both Colorado's Reto Berra (above) and Niklas Svedberg of Boston, the Avalanche finally managed their first goal of the season 7 minutes into the second when Jamie McGinn’s wrist shot trickled through Svedberg’s arm. It should have been stopped, but the Avs weren’t complaining. Boston tied it on a power play a few minutes later after Loui Eriksson took a pass and slid the puck into the net behind a sprawling Berra. The only other highlight was a fight between Adam McQuaid and Cody McLeod in what must be the latest battle in an ancient Scottish feud. McQuaid won decisively. The third period was similar to the first, with chances at both ends but no goals. It looked like overtime would be required until Colorado began to press with about 30 seconds to go. A couple of shots were saved but Boston could not clear the zone. A shot from the point by Jan Hedja was kicked out by Svedberg, right onto the stick of Daniel Briere, who scored into the gaping net as time expired. The green light indicating the end of the period was on, so at first it looked like the goal would not count, but the shot had entered the next with half a second to spare; the goal judge was just too slow to activate the red light. 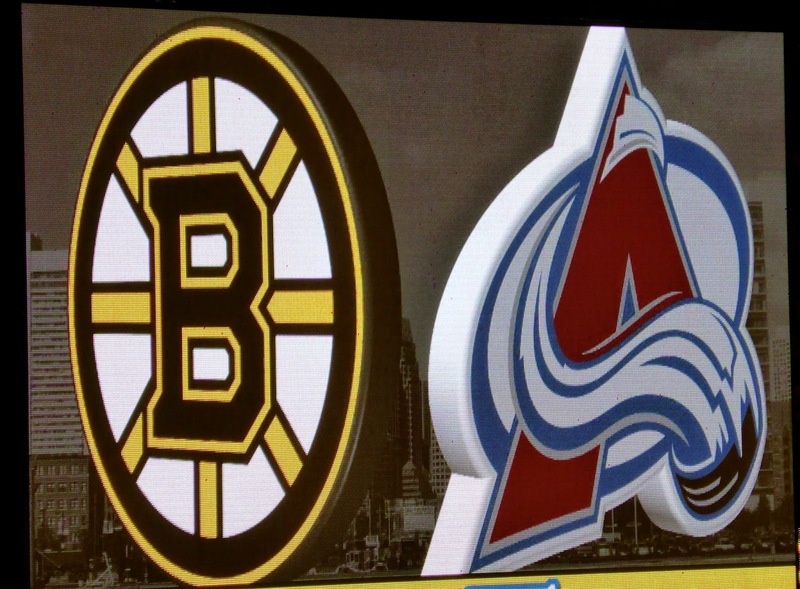 Colorado went wild while stunned Bruins fans looked at each other in disbelief. Really an incredible ending to what was a pretty average NHL game. It was so unbelievable that the scoreboard operator took a while to update the final score. 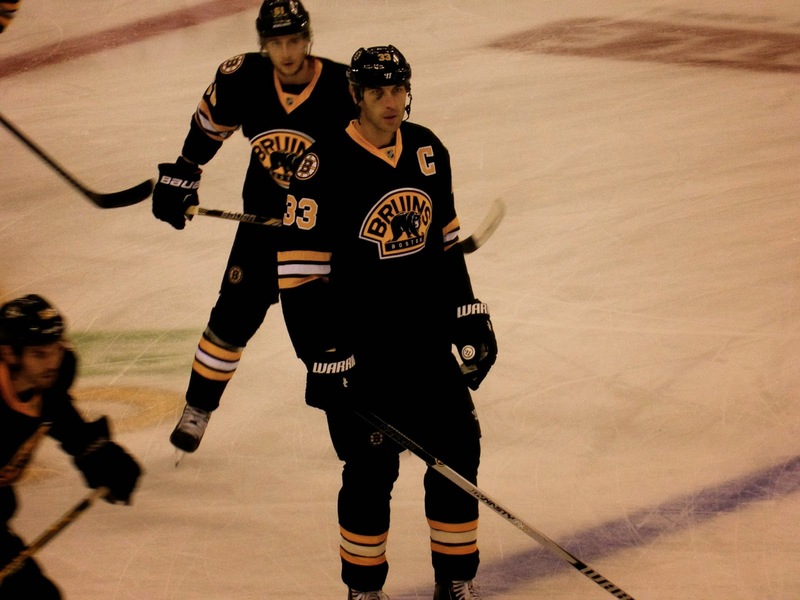 The Bruins wore their very cool third jersey, with Zdeno Chara sporting a matching shiner. I like that the scoreboard uses this logo as well, a nice touch that shows somebody is paying attention to the little things in Boston. The winner was Briere's 300th career goal. He's now just 260 behind teammate Jarome Iginla, who had played for the Bruins last season. I’m in Detroit this weekend for another episode in my Toronto on the Road series as the Red Wings and Leafs engage in an Atlantic Division battle. Sunday sees the Saints at the Lions in what should be an intriguing game – can the Saints offense overcome the #1 defense in the NFL? Check back next week for the recap.